75 per cent of IBA loan approvals in WA were outside major centres. When Gnaala Karla Booja man Rodney Rankins talks about home ownership, his eyes light up with pride. He became the 19,000th home loan that Indigenous Business Australia (IBA) approved for Aboriginal and Torres Strait Islander people since its inception. 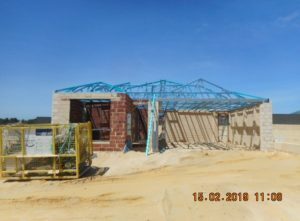 Mr Rankins is constructing his home in a new housing development in Banksia Grove of the Perth suburbs of Western Australia. Once built, he will relocate from Parmelia to Banksia Grove. ‘I never thought I’d be able to own my own home,’ said Mr Rankins. ‘I thought it was going to be much harder, but there’s people to talk to and IBA helped me through the process. ‘There’s a lot to find out and paperwork involved with building a house. IBA pretty much knows everything about it. IBA’s home ownership program is one of the longest standing programs successfully supporting economic self-management and self-sufficiency for Aboriginal and Torres Strait Islander people. A recent Deloitte Access Economics study surveyed over 1000 people who had been through the IBA home loan program and found that nine out ten reported improved living conditions, self-esteem and overall happiness. The study also found that since inception, the Indigenous Home Ownership Program has generated $895 million in social and economic benefit for homeowners, $483 million in economic activity through construction and over 1200 full time equivalent jobs. For Mr Rankins, home ownership was always a dream and he encourages others to put the work in to finding your goals. ‘I’ve not felt like that in a long time. I was overwhelmed with happiness. It was awesome! CEO Rajiv Viswanathan says we’re well on our way to our goal of supporting 70,000 Aboriginal and Torres Strait Islander people and their families to live in homes they own by 2023. ‘Demand for home loans continues to grow year on year, with current applications at record levels across the country. We’ve seen Western Australia significantly increase in the past three years. ‘Home ownership is a key pillar on the journey to economic independence, providing not only stable housing, but also an anchor from which to build an asset base for current and future generations, and equity for other investment and business opportunities. ‘With over 97 per cent of our loan approvals in WA for first home buyers, we understand this is a new process for them and we want to support them in their success. ‘The home ownership journey is about planning for the future and IBA offers info sessions on our home loan process as well as our recently launched budgeting workshops that provide tools to Indigenous Australians to support them on their path so they are ready for home ownership. Interview with Rajiv Viswanathan and/or Rodney Rankins available on request. Photos also available on request. About IBA’s home ownership offering: IBA assists Indigenous Australians into home ownership by providing home loans and support to get ready for home ownership. By owning their own home, Indigenous families and home owners can obtain a secure, safe place to live and build intergenerational wealth.